“I really just fell into it.” Karie H., a blogger and freelance technical writer living in Arizona happily shares how her good fortune landed into her lap(top). As a non-engineer, non-technical person, getting thrown head first into a technical writing position was quite a lucky happenstance. Karie has a background in finance, and is the owner of a lifestyle blog called The Five Fish where she talks about parenting, organic living, recipes, and more. But her day job isn’t as creative: She’s a freelance technical writer. She doesn’t mind the mundane nature of her work; she’s exceptionally grateful to have been able to couple her knowledge of finance with her love of writing. It’s been a marriage made in heaven. If you think of a tech writer, does your brain conjure up an image of a sort of thick-glasses, borderline dorky person with multiple degrees and certifications after his or her name? What you’d expect isn’t always the case. 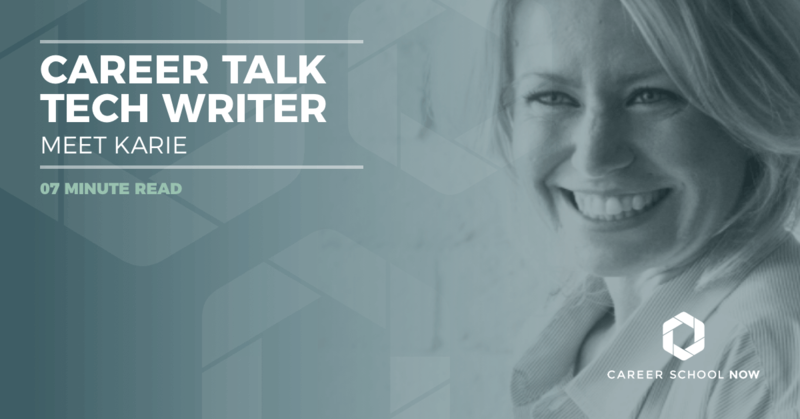 Karie considers herself a mean storyteller, but she’s not a certified tech writer and has no suffixes. Yet, that doesn’t affect her when it comes to gaining clients. Coming from a finance background, combined with a talent for writing, Wells Fargo had Karie working with all the federal investors to create lending guidelines, manuals, and walkthroughs for the bank employees and users.“Working at Wells-Fargo, I was an integral part of the team, so the amount of information I picked up was substantial. I took out that very technical legalese, and made it user friendly.” She is able to show proof of work, her documents she created, which can be found right on the Wells-Fargo website. So, not having certifications hasn’t deterred clients from hiring her because she can say “Hey, here’s what I’ve written, take a look.” And usually, pleased clients is an understatement. She feels validated because of how happy her work makes her clients, even without having a certification. In an industry where you can charge anywhere between $35-$85/hour, Karie loves that she’s able to earn a great living doing what she loves, “You can make this career as lucrative as you want by putting in as many or as little hours. It’s all about time management and, since you’re the boss, you can decide how to allocate your time.” Karie makes sure to make the most of her time so that when she bills her clients, they can see that not only is she getting the job done, but also, she’s efficient. And, she can still have a life outside of work. The balance is there. Karie realizes how lucky she truly is. And well connected, apparently. Not just with the way her biggest client found her (through her husband’s company) but, in general. Finding new clients just hasn’t been part of her daily struggle. She says it’s all about utilizing your social networks. “LinkedIn has been huge for me. And, I’ve never really used it in that type of capacity before. But, that’s where my clients seem to be finding my profile.” She attributes it to the fact that she uploaded her resume directly onto her profile, which makes it easy for prospective clients to see her qualifications. She highly recommends doing that, if you haven’t already. And then, there’s Facebook. It’s become so much more than a way to keep in touch with long lost relatives and friends. It’s become a major networking tool for her. “Accepting friend requests from others in an industry that can only get you ahead of the game.” She’s made Facebook a part of her branding, instead of simply using it for personal updates. She laughs because her clients get to see two sides of her, her family life and professional accomplishments, all under the guise of a status update. Choosing to focus on a specific niche, like mom and pop companies or small businesses, is a good idea, advises Karie. “Doing a great job for them, helping them build their company, is very gratifying.” Not to mention, their word-of-mouth praises are a great business generator. They tell a business owner friend, who tells another business owner friend, and so on. Until, you’re getting so much work that you have to hire someone for your own small business that’s being built. Karie Noel Herring lives in Phoenix, AZ with her husband and their three children. After spending over 15 years in corporate finance and consumer lending, Karie went into business for herself as a freelance writer. Her hobby for writing and blogging began bleeding over into her corporate career when she was recruited to pen standard operating procedures and lending guidelines. Karie was a sought after SME in her division for consumer lending and risk with some of the largest banking and lending firms. Realizing how much she enjoyed the performance savvy her employer and employees reaped as a direct result of her contributions, she began to pursue a new career as a freelance technical writer. Today, Karie runs her own digital consulting firm, assisting organizations in single-source, information architecture and high-quality documentation in understandable text; which includes, but is not limited to digital content in the form of Wiki development and deployment. In her free time, Karie can be found doing Crossfit style workouts at Rush Club Human Performance Center, Jeeping with her family, or pursuing her other passion for cooking.